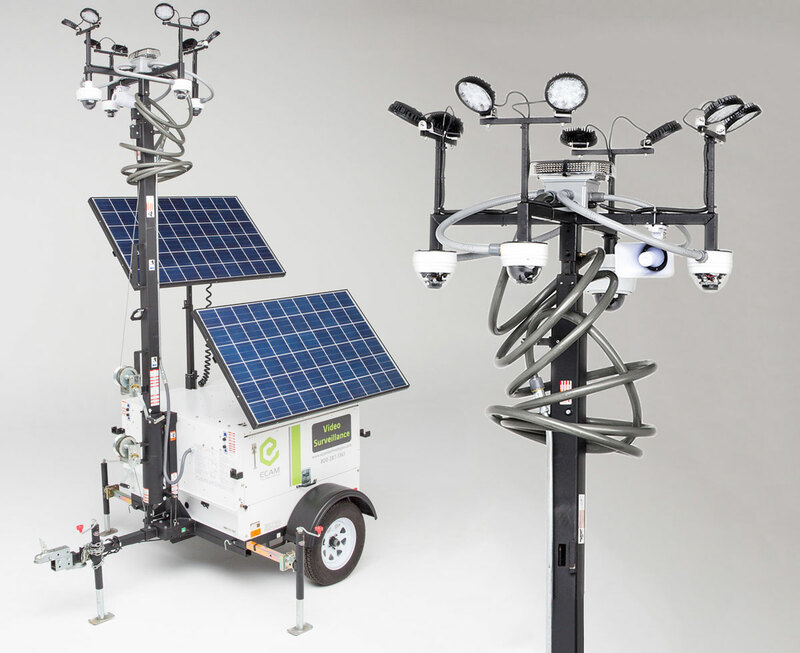 The MSU Hybrid is our newest solar-powered portable security camera system. 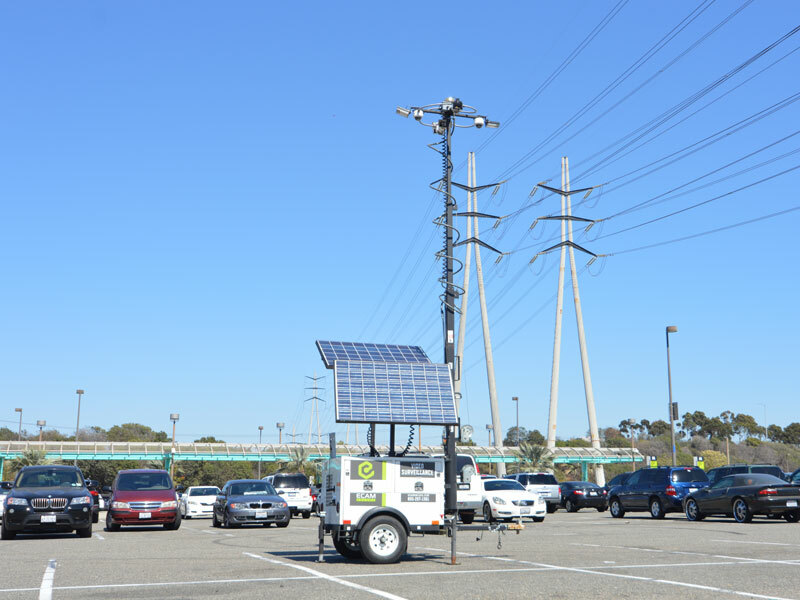 The unit is highly flexible, with the ability to seamlessly switch between its integrated solar panel array and its environmentally friendly diesel powered generator for use on cloudy days. This completely mobile security system can be placed anywhere, no power source needed. With powerful bright white LED lighting and convenient online-accessible security cameras, it’s the best way to provide temporary or permanent security to any location while still staying green. The MSU Hybrid is especially helpful at parking lots, gatherings and events, and for use by police. The MSU Hybrid is ideal for parks, and parking lot security where a temporary security solution is needed. The MSU Hybrid can be positioned where ever security is needed. The presence of a surveillance system can deter vandalism, theft and protect our citizens. Criminals are less likely to strike if they know they are being watched. Applying the MSU Hybrid allows you to view a live feed of the location, record and monitor giving you evidence in the event of an incident. The MSU Hybrid is a solid, rugged, yet mobile surveillance system. With its ability to be easily relocated to different parts of a venue, or even between sites, it offers the flexibility to present a strong front to would-be criminals without sacrificing functionality. 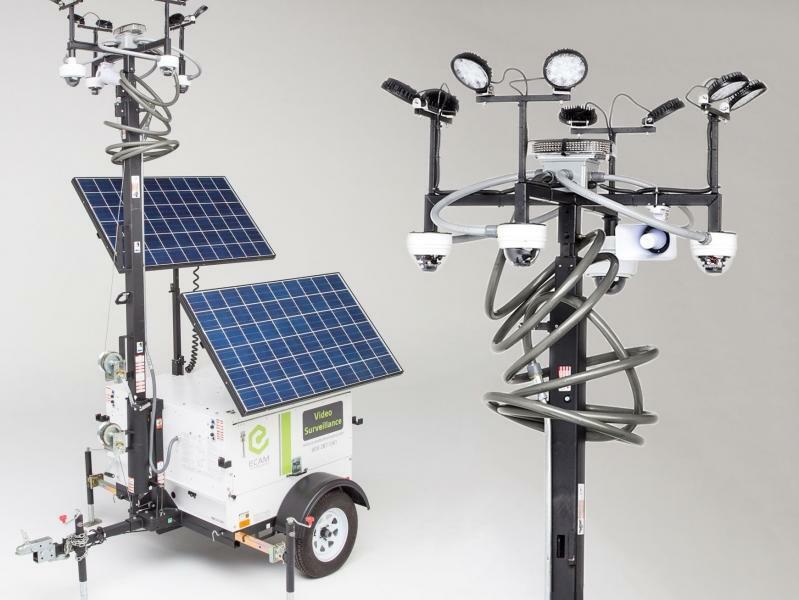 With its dual solar- and diesel-powered options, these cameras are completely independent of grid or generator power. 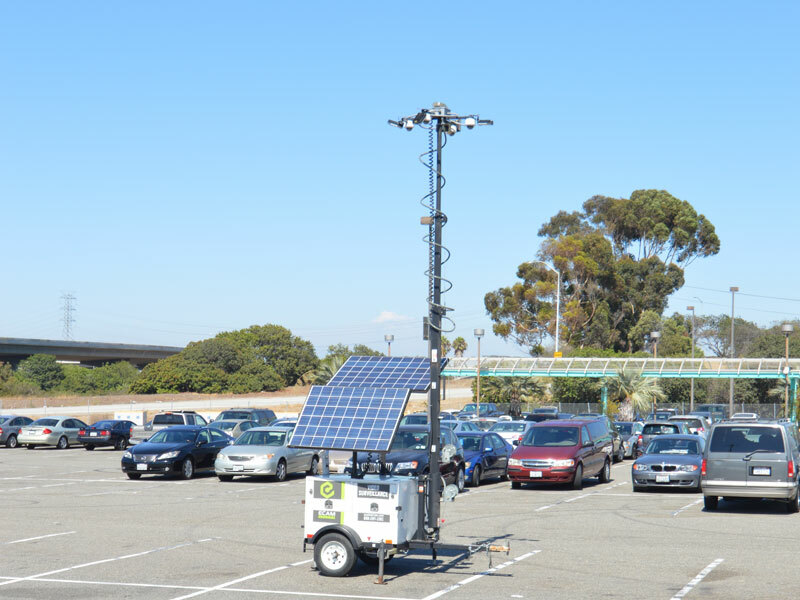 Having security cameras that are easily visible is very important, especially in high-risk and temporary areas such as parking lots, parks, and festivals. Our MSU Hybrid is hard to miss, potential trespassers will know that they are being watched and are less likely to attempt any suspicious activity. ECAMSECURE’s Mobile Surveillance Units are specially designed to warn trespassers that they are being filmed. They can be easily moved to ensure that all parts of your property are protected. Law enforcement agencies have been using our MSUs in areas with high crime levels in an attempt to slow these ever-climbing rates. The local police have found our cameras to be extremely effective and plan to install more to help keep their neighborhoods safe. We can customize your MSU Hybrid to fit any security needs. Options include thermal cameras, HD PTZ cameras, license plate capture and time lapse capabilities. 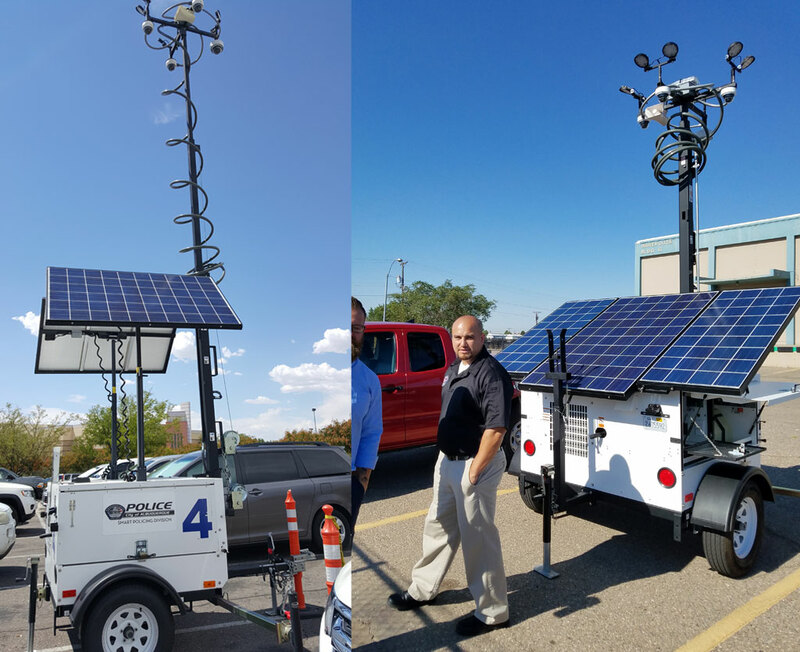 Read about how the Albuquerque PD uses our custom MSU’s to help prevent crime or download the case study. Security in the construction world is an ongoing struggle between effectiveness and budget. Although a crucial component of any security solution, surveillance cameras are typically expensive to install and expensive to run.Traditionally, cameras must be connected to a recorder of some type, and also to power. Wires are vulnerable to being cut or tripped over if simply laid on the ground. Many jobsites settle for simply mounting the cameras to the office trailer and calling it a day, but this can leave enormous gaps in coverage. Continuous protection and online-accessible footage of every entrance to a construction site are crucial to protecting the enormous investment of equipment and materials from even casual thieves. Traditional camera solutions must be powered from the grid or gas generators, as well. Grid power is simply not an option on most jobsites, and the thought of running a generator 24/7 would give any CFO a splitting headache. Most construction sites are by their very nature temporary, but traditional camera systems are not. The labor and materials cost sunk into designing and implementing a surveillance system is rendered moot when the job is done. The cameras are taken down, the wires are removed and often rendered unusable in the process, and the whole process begins again at the next job. It is flexible and mobile, able to be rolled around the jobsite as needed. At the end of construction, simply roll it onto a truck and take it to the next site. There are no wires to run or be cut. The MSU Hybrid even provides its own light with a powerful LED array. Best of all, the unit accomplishes all this without sacrificing security and efficiency. Fully customizable with a range of online accessible construction cameras, including night vision and license plate capture options, the MSU Hybrid can protect your valuable investment at any time, in any conditions. The MSU Hybrid saves costs in other ways, too. The built in 4K generator can be used as a power source for tools and equipment, eliminating the need for a separate generator. By utilizing the solar energy and diesel power built into the MSU, the entire jobsite can become a little greener. It’s good for the environment, and good for the bottom line. The MSU Hybrid is the perfect answer for construction sites hoping to stay green while still staying under budget and protecting their investment. With the MSU Hybrid, professional-grade surveillance cameras can be deployed anywhere, anytime. Self-powered using environmentally friendly means, and self-contained without the need for cumbersome wires, the MSU Hybrid lets you save with renewable resources while still staying safe. What makes the MSU Hybrid stand out from the competition? Our MSU Hybrid is developed using top industry products and technology. We begin with a Generac heavy duty light tower as the foundation. The Generac light tower and generator are covered by a 2-year manufacturer warranty that includes service at any Generac dealer in the country. Why is your MSU priced less than the competition? Our Mobile Surveillance Units are manufactured at high volumes to replenish our rental fleet. We produce approximately 10 units per week, and that allows us a bulk purchase discount for our equipment and materials. We then pass that discount onto you. Currently, we are in the process of receiving GSA certification. We work closely with several resellers that are certified with GSA. This means that for government agencies, we can get you in contact with one of our certified resellers. Is the camera connection secure? The camera connection is protected. We can provide VPN tunneling or SSL certificates if required. Can you customize an MSU to fit our needs? We can customize our Mobile Surveillance Units to secure any number of different environments. All units are compatible with a variety of cameras, lights, and sensors, and can be integrated into your existing Video Management System. What is your standard camera? Our standard cameras are Hikvision, Axis and Open Eye.